A Homecoming gathering of athletic training alumni and students served to honor a special place—and person. 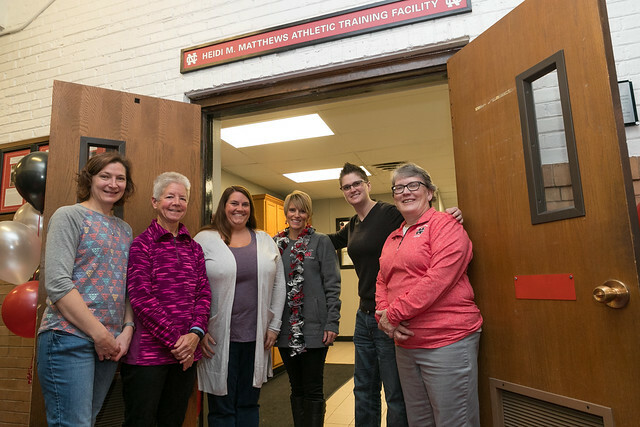 A ribbon-cutting ceremony marked the official christening of the Heidi M. Matthews Athletic Training Facility in Merner Field House. Matthews, professor of kinesiology emerita, is known as the architect of the College’s athletic training program over the past 25 years. For many years, this modest teaching and treatment suite was the home of the program and served as the sole athletic training room for all athletic teams and events like national track and field championships. She recalled the many College athletic triumphs supported by “the work done in this room,” as well as the episodes of an overflowing whirlpool and attempts at “home improvements” by herself and others. Both Matthews and Selsky spoke of the family atmosphere of the program and noted that like a family, generations of students have stayed connected. Jill Ferree ’97, the head athletic trainer at Downers Grove North High School, welcomes North Central students as interns. Kirsten Probst ’19 learned under Ferree last fall working with all fall sports. Other students at the event recalled meeting Matthews on their first visits to North Central and the impact of those meetings on their enrollment decisions and future careers. Heidi Matthews cuts the ribbon on the training facility named in her honor.